Lt. Gov. 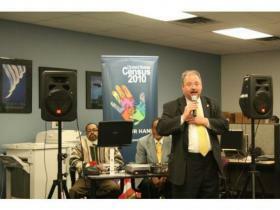 John Cherry spoke to the importance of participation in the 2010 Census Tuesday evening at Ypsilanti's Michigan Works! office. Jan. 22, 2010 · 3:08 p.m. The 2010 U.S. Census kicked off Tuesday in Ypsilanti and it comes with 1,000 jobs in the area for those who could use the work. Toine Murphy, a partnership specialist for the U.S. Census Bureau, said the jobs are temporary but could serve as an economic infusion to the county, state and country. Murphy said the bureau is already hiring so work can begin after questionnaires are mailed to U.S. residents in March. The work in the area, which will occur all around the country, begins when the bureau needs to follow up with households that have not mailed out their responses to the 10 questions in the mailer. The mailed questionnaire, which Murphy said is very noninvasive and basic, will be expected to be returned to the bureau by April. Murphy said those hired in the area will visit residents who did not return the mailer. The bureau must have the census completed and on President Barack Obama’s desk by Dec. 31. Those who apply with the bureau will take a 28-question competency test that will determine their place among the pool of candidates. Murphy said candidates can take the test as many times as they want until a desired score is achieved. Murphy estimated the work could last into June. The positions are hourly and vary in pay from $10.75 to $18.00, depending on the title and area of work. Aside from the work, Murphy also said the bureau is trying to educate residents about the census itself, and its importance to Michigan in particular. He said Michigan could risk losing two representatives in the U.S. House of Representatives if the census finds the population has dropped too much in the state. He said this is why it’s important for residents to return their questionnaire to the bureau. The importance of the census may be what attracted Lieutenant Governor John Cherry to the kick-off event held at the Michigan Works! office on Harriet Street Tuesday night. He said more than 200 people turned out Tuesday. For those interested in applying for a position at the U.S. Census Bureau, call 1-866-861-2010, or visit www.census.gov/detroit. A practice exam is also available to potential applicants.